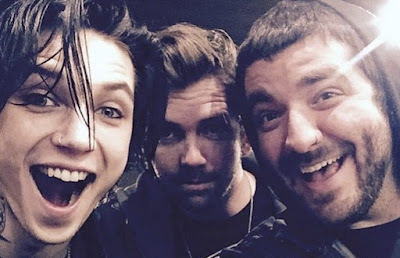 The guitar tech for Black Veil Brides, Asking Alexandria and Motionless In White, Chris Holley, passed away in his sleep last night in Los Angeles. Below you can read some message from Black Veil Brides, Asking Alexandria, Motionless in White and more. There's is no way I could convey the sadness that it brings to share with you all the passing of our friend and brother..the beautiful and kind Chris Holley. Chris has worked for us as a guitar tech for only a short time but has quickly become one of my best friends in the world. As one of the most sincere and passionate human beings I have ever met it is not hard to understand why he has touched the hearts and minds of so many and while I do not feel that I am even qualified to share this news with you, we thought it was best before the Internet got a hold of his story to honor this amazing man in the most fitting way I know how to which is to simply say that Chris was one of a kind and will forever be missed. Chris passed in his sleep last night after arriving in Los Angeles, that is the only information we currently have and we request that everyone respects his family and friends by awaiting anything further from the official coroner's report. We lost a musician, a friend and a true brother. I love you so much Chris. Team tall guys forever. No one will ever truly understand what family really means until they are in that moment where you need someone more than you need oxygen. Chris has been my life line, my best friend, my family since the day I met him. He held me up when I was down. He kept me grounded when I was flying too high. My love for Chris can never be put into words. Thank you Chris for just being you. I love you. I don’t even know how to put into words what I'm feeling right now. I saw you yesterday, and today you're gone. There are friends and there are brothers. Today I lost a brother. I love you. I will stay strong for your mom. Terror Twins for life. Can't believe you're gone man. Chris Holley was fun to be around and a hard worker. We shared many laughs and the dumbest inside jokes. Such terrible news. Rest In Power brother. Chris Holley, it was nothing but a pleasure to know you, be on the road with you for over a year, and share the many ridiculous conversations we've had about life, music, relationships, and our mutual love for Strike Anywhere. I will be jamming Exit English all night for you. RIP, my friend. You will be greatly missed. Today we have lost one off the best guys on this Earth.. One of my best friends. I will miss you so much it's untrue. We have shared some of the most amazing, funny and crazy times I've ever had in my life. My heart goes out to all the family and friends that will be missing him through this upsetting time... I love you so much brother. Hey Chris the short time we've hung out you've been nothing but genuine and awesome. May you rest in peace buddy.